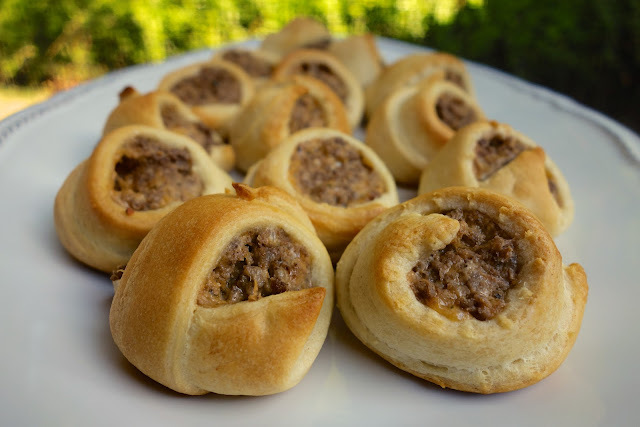 Taco Crescents - taco meat, cream cheese and cheddar wrapped in crescent rolls. Great for a quick dinner or party!! serve with a salsa ranch dipping sauce. 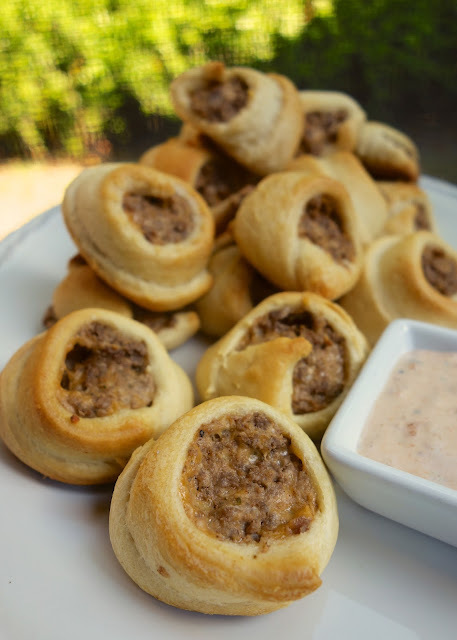 These taco crescents were inspired by one of my favorite breakfast/tailgating recipes - Sausage and Cream Cheese Crescents. I was thinking about new recipes and wondered how taco meat would taste instead of sausage. I gave it a try and it was fabulous! You can make the meat mixture ahead of time and store it in the refrigerator until you are ready to bake the crescents. I like to do bite size crescents. I split the crescent roll in half to make two triangles. Feel free to skip that and just put double the meat on one full crescent roll. I used lean ground beef, low fat cream cheese and low fat crescent rolls and I couldn't tell a difference. I served the crescents with a little salsa and ranch for dipping. These Taco Crescents are great for a quick lunch or dinner. They would even be perfect for tailgating! I can't wait for college football next week! Are you as excited as I am?!? Cook the ground beef or turkey in a skillet. Drain fat. Mix hamburger, taco seasoning, cheddar cheese and cream cheese together. Separate rolls into triangles. Cut eat triangle in half lengthwise. Scoop a heaping tablespoon onto each roll and roll up. Yes! WAR EAGLE!!! These would be perfect for tailgating, or couchgating for that matter! shelley - couchgating - I love it! Sometimes that's all I can manage! You can also just make squares. Put one package of crescent rolls on bottom of 9X13 pan, spread the meat mixture & sprinkle cheese on top & then top with 2nd package of crescent rolls. After baked, cut into squares. Same flavor but less time consuming. Thank you for the great idea! I made these today with my children at daycare. Making them as squares was so much easier and used only two packages of crescent rolls! Just needed to bake them a little longer, about 25 minutes. Giving these a try tonight before gameday. War Eagle! Hi! I'm a new reader. I thought I would try this recipe since it looked so easy... and it was! It tasted soo good, and my hubby said I could make it again (always a HUGE plus!). Thank you very much for this recipe! I'll definitely be making it again! What was your dipping sauce? Looks delicious! I made these the other night and found them to be very pretty out of the oven but overly salty. I would recommend cutting back on the taco seasoning to 1/2 or 3/4 ounce to lessen salt. Otherwise very good. Great way to get a toddler who loves bread to eat taco meet for the first time! Could these be made ahead maybe frozen and warmed up?